Prince Hso Khan Pha of Yawnghwe (Burmese : စဝ်ခမ်းဖ, aka Tiger; 15 April 1938 – 4 October 2016) was a consulting geologist who lived in exile in Canada. He was a son of Sao Shwe Thaik, the Saopha of Yawnghwe and Sao Nang Hearn Kham, the Mahadevi (consort). Sao Shwe Thaik was the first President of the democratic and newly independent Union of Burma from 1948-52. Sao Shwe Thaik was the first president of the Union of Burma and the last Saopha of Yawnghwe. His full royal style was Kambawsarahta Thiri Pawaramahawuntha Thudamaraza. He was a well-respected Shan political figure in Burma. His residence in Nyaung Shwe (Yawnghwe), the Haw, is now the "Buddha Museum" and is open to the public. Kalaw is a hill town in the Shan State of Myanmar. It is located in Kalaw Township in Taunggyi District. Theinni or Hsenwi is a town in northern Shan State of Burma, situated near the north bank of the Nam Tu River and now the centre of Hsenwi Township in Lashio District. It is 28 miles north of Lashio. It is 2,100 feet above sea level. West Africa is the westernmost region of Africa. The United Nations defines Western Africa as the 16 countries of Benin, Burkina Faso, Cape Verde, The Gambia, Ghana, Guinea, Guinea-Bissau, Ivory Coast, Liberia, Mali, Mauritania, Niger, Nigeria, Senegal, Sierra Leone and Togo, as well as the United Kingdom Overseas Territory of Saint Helena, Ascension and Tristan da Cunha. The population of West Africa is estimated at about 362 million people as of 2016, and at 381,981,000 as of 2017, to which 189,672,000 are female, and 192,309,000 male. Flin Flon is a mining city in Canada. It is located on a correction line in the boundary of Manitoba and Saskatchewan, with the majority of the city located within Manitoba. Residents thus travel south into Saskatchewan, and north into Manitoba. The Shan are a Tai ethnic group of Southeast Asia. The Shan live primarily in the Shan State of Burma (Myanmar), but also inhabit parts of Mandalay Region, Kachin State, and Kayin State, and in adjacent regions of China, Laos, Assam and Thailand. Though no reliable census has been taken in Burma since 1935, the Shan are estimated to number 4–6 million, with CIA Factbook giving an estimation of 5 million spread throughout Myanmar. The Shan States (1885–1948) were a collection of minor Shan kingdoms called mueang whose rulers bore the title saopha in British Burma. They were analogous to the princely states of British India. There were three Burmese invasions of Assam between 1817 and 1826, during which time the Kingdom of Assam (Ahom) came under the control of Burma from 1821 to 1825. Locally, this period, called the manor din by the Indigenous Assamese people and Chahi-Taret Khuntakpa in Meitei, is remembered with horror. It was the climactic period of the 600-year history of the Ahom kingdom. The sharp drop in population due both to depredations as well emigrations left the erstwhile kingdom in shambles. The British, who were earlier reluctant to colonise Assam, came into direct contact with a belligerent Burmese occupying force. Following the First Anglo-Burmese War they annexed not just Assam but also Burma. Yawnghwe, known as Nyaungshwe in Burmese, was a Shan state in what is today Myanmar. It was one of the most important of the Southern Shan States. Yawnghwe state included the Inle Lake. The administrative capital was Taunggyi, located in the northern part of the state. The Agent of the British government, the Superintendent of the Southern Shan States, resided at Taunggyi and the king's palace was at Yawnghwe. The Panglong Conference, held in February 1947, was an historic meeting that took place at Panglong in the Shan States in Burma between the Shan, Kachin and Chin ethnic minority leaders and Aung San, head of the interim Burmese government. Aung Zan Wai, Pe Khin, Bo Hmu Aung, Sir Maung Gyi, Dr. Sein Mya Maung and Myoma U Than Kywe were among the negotiators of the historical Panglong Conference negotiated with Bamar representative General Aung San and other ethnic leaders in 1947. All these leaders unanimously decided to join the Union of Burma. On the agenda was the united struggle for independence from Britain and the future of Burma after independence as a unified republic. Bodawpaya was the sixth king of the Konbaung Dynasty of Burma. Born Maung Shwe Waing and later Badon Min, he was the fourth son of Alaungpaya, founder of the dynasty and the Third Burmese Empire. He was proclaimed king after deposing his nephew Phaungkaza Maung Maung, son of his oldest brother Naungdawgyi, at Ava. Bodawpaya moved the royal capital back to Amarapura in 1782. He was titled Hsinbyumyashin, although he became known to posterity as Bodawpaya in relation to his successor, his grandson Bagyidaw, who in turn was given this name in relation to his nephew Mindon Min. He fathered 62 sons and 58 daughters by about 200 consorts. The Shan State Army was one of the largest insurgent groups that fought government forces in Shan State, Myanmar (Burma). The SSA was founded in 1964 after the merging of two existing insurgent groups. Momeik, also known as Mong Mit in Shan, is a town situated on the Shweli River in northern Shan State of Myanmar (Burma). Hsipaw, is the principal town of Hsipaw Township in Shan State, Myanmar on the banks of the Duthawadi River. It is 200 km (124 mi) north-east of Mandalay. Panglong, also known as Pinlon, is a town in Loilem Township of Loilem District, southern Shan State, Myanmar. The town is also home to Panglong University. Hsipaw (သီႇပေႃႉ) was a Shan state in what is today Myanmar. Its capital was Hsipaw town. Hsipaw State was perhaps one of the most well known and powerful saopha Shan States. Mongmit or Möngmit was a Shan state in the Northern Shan States in what is today Burma. The capital was Mongmit town. The state included the townships of Mongmit and Kodaung. 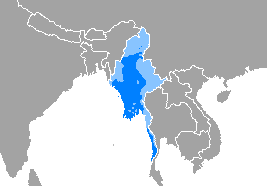 North Hsenwi was a Shan state in the Northern Shan States in what is today Burma. The capital was Lashio town which was also the headquarters of the superintendent of the Northern Shan State. North Hsenwi, with an area of 6330 m², had a population in 1901 of 118,325 persons and an estimated revenue of £6000. Sao Nang Hearn Kham, Daw Hearn Kham was the Mahadevi of Yawnghwe one of the most important Shan States. Her husband Sao Shwe Thaik was the 23d and last Saopha of Yawnghwe and became the first President of Burma and she became the very 1st First Lady of Myanmar. She had five children with him. Sao Kya Seng or Sao Kya Hseng was a politician, a mining engineer, an agriculturalist and the last saopha of Hsipaw State, Myanmar, from 1947 to 1959. He studied mining engineering at the Colorado School of Mines in Golden, Colorado, United States, from 1949 to 1953. He graduated with a BSc degree in 1953 and then married. His bride, Sao Nang Thu Sandi or Inge Eberhard, a German-speaking Austrian student who had received a Fulbright Scholarship in 1951, was studying at Colorado Women's College, a constituent college of University of Denver. In 1954, he returned to Burma with her, and they had two daughters, Mayari and Kennari.